This week is very important for EUR because of the ECB statement and press conference. 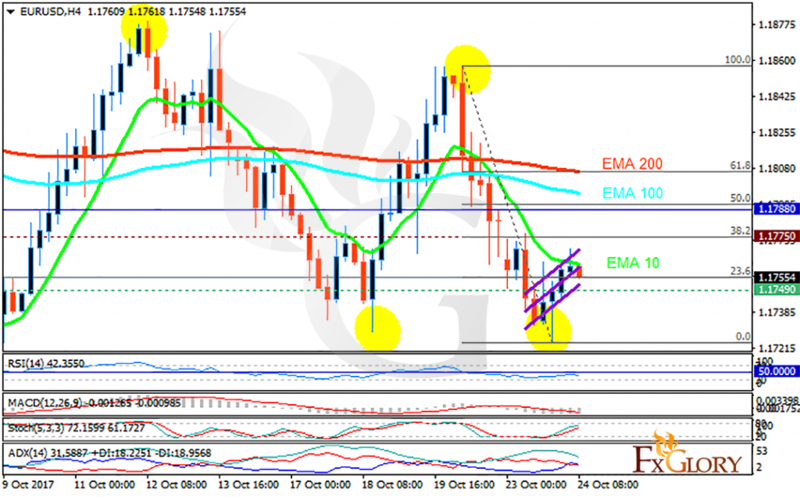 Today EURUSD is chiefly under the influence of the manufacturing and services PMI in Eurozone. The support rests at 1.17490 with resistance at 1.17750 which both lines are below the weekly pivot point at 1.17880. The EMA of 10 is moving with bearish bias in the ascendant channel and it is below the EMA of 200 and the EMA of 100. The RSI is falling towards the oversold area, the Stochastic is moving in high ranges and the MACD indicator is in negative territory. The ADX is showing buy signals. The indicators are showing mixed signals. If the support area remains intact, EURUSD will grow towards 61.8 level of Fibonacci at 1.181.